The only way in to Italy was through the Mont Blanc Tunnel, something that I have been excited about driving through for a while, but the 35 euro toll took a little of the shine off and after the first 2 minutes it gets a little….well, boring to be honest. Oh, and there’s also the fact it cost 35€’, did I mention that already? Tunnels seemed to be the theme of Thursday as we made our way south though Italy and we reckon we must have passed though at least 100 km’s worth of them, none of them charging 35€ I might add. It took 7 hours to drive to the campsite we are presently at, the car performing faultlessly I might add except for making its way though more fuel than the Deep Water horizon pumped into the Gulf of Mexico! (too soon?). 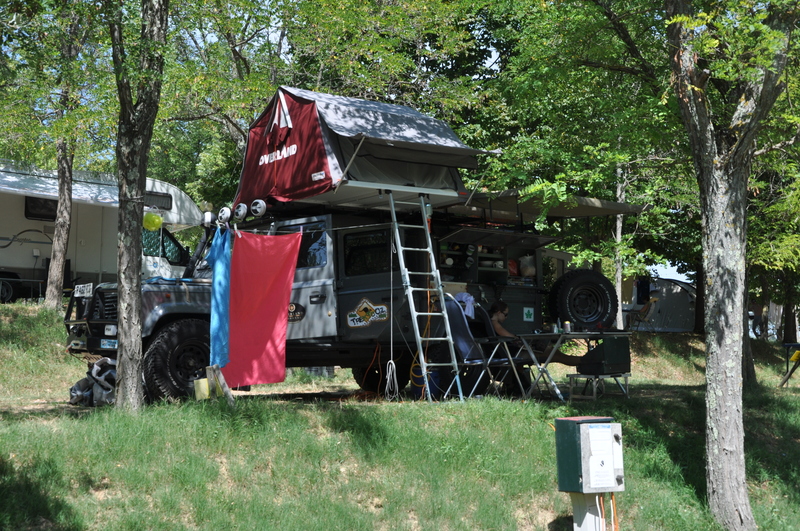 The campsite is just north of Siena in an idyllic little town, which looks just as you imagine a Tuscan village should. There is one problem however… Now most people who know me would say that at times I am prone to exaggeration, which I’ve never understood, and being the most amazing guy in the world I find this hard to believe, however, on this particular occasion Megan will stand witness. Within minutes of arriving at the campsite I had been bitten no less than 12 times! This does not bode well for more tropical climates, and insect repellent will now have to be bought in more industrial sized quantities. On a side note, we would both like to thank everyone for the messages of support we have received through the blog, many from people we don’t even know! We really do appreciate it. What’s your daily spend these days? What are those bite like bumps all over your legs Simon? If you’re not going through Pakistan how much is it going to cost to ship that Land Rover of yours? Doesn’t Simon’s snoring keep you awake Megan? What are you going to do once the Cheerios supply runs out, seeing as you can’t buy them anywhere other than Sainsbury’s? I’m really quite amazed you’ve managed to pull this off! It only seems like yesterday that you were telling me about your trip and now you’re into your second week already. I’ve never seen a decent photo of the landy, and it really is a beast!! The photos and blog are a really good read so keep them up, everywhere looks amazing. Hopefully Emma and I will be able to meet up somewhere along the way but we’re off to NY for new years so it won’t be anytime then. I will of course always be in touch, but keep having a great time and drive safe.